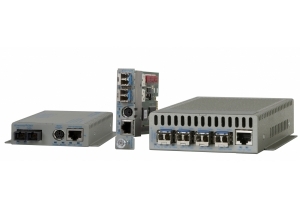 The iConverter® GM4 is a Network Interface Device (NID) that delivers advanced Carrier Ethernet 2.0 services and provides demarcation at the edges of a network. The GM4 enables rapid service deployments, Service Level Agreement (SLA) assurances, comprehensive fault management and service protection. The iConverter® GM4 is a Network Interface Device (NID) that delivers advanced Carrier Ethernet 2.0 services and provides demarcation at the edges of a network. The GM4 enables rapid service deployments, Service Level Agreement (SLA) assurances, comprehensive fault management and service protection. These advanced capabilities reduce operating costs, provide faster return on investment (ROI) and improve customer satisfaction. The GM4 supports MEF-certified User-to-Network Interface (UNI) functions including Class of Service (CoS) management, granular rate-limiting, and 802.1ad Provider Bridge VLAN stacking (Q-in-Q) for service multiplexing of multiple E-Line, E-LAN and E-Tree services. The GM4 provides flexible per-flow service mapping, traffic policing and shaping. CIR/EIR “two rates, three colors” ingress port policing provides the granular bandwidth optimization required for CE 2.0 services such as Business Ethernet Services and Mobile Backhaul. The GM4 also provides advanced classification and filtering of subscriber traffic as an EVC or CoS flow based on Layer 1, 2, 3 or 4 identifiers. The GM4 provides comprehensive support of the latest carrier class Ethernet Service OAM standards, enabling service assurance and reducing operational costs. IEEE 802.1ag Connectivity Fault Management (CFM) pro-actively monitors service availability and provides tools for rapid fault isolation. ITU-T Y.1731 Performance Monitoring provides the ability to monitor SLA parameters including frame delay, frame delay variation and frame loss. Hardware-based Delay Measurement and Loopback Measurement with nanosecond resolution provides the highest level of service testing and SLA assurance for delay sensitive voice and financial services. Zero-Touch Provisioning (ZTP) enables efficiencies in service activation that accelerate turn up and reduce the need for on-site technicians. ZTP allows service provisioning to be centralized, standardized and remotely managed to reduce OPEX and provide faster return on investment. For Cable MSOs, the GM4 supports the CableLabs® DEMARC Auto- Configuration (DAC) standard for automating the provisioning of Ethernet services over DPoE networks. The GM4 supports ITU-T Y.1564 and RFC 2544 service testing to easily verify the configuration and performance of Ethernet services prior to customer hand off. RFC 2544 provides per-flow testing of Key Performance Indicators (KPI), such as throughput, latency, jitter and frame loss up to full wire speed. Y.1564 is a comprehensive Carrier Ethernet testing standard that tests all data flows and service attributes, including multiflow Information Rate and Traffic Policing. Y.1564 tests all performance attributes simultaneously so testing is run quickly and efficiently, and can detect potential interaction between data flows. The GM4 supports ITU-T G.8031 Ethernet Linear Protection Switching and G.8032v2 Ethernet Ring Protection Switching with Connectivity Check Messages (CCM) at 3.3ms rate for sub-50ms protection switching. G.8032v2 includes multi-ring protection and sub-ring support with 5-Port GM4. The GM4 is available as a compact standalone unit or as a chassis plug-in module. The hot-swappable plug-in module is available in 2 and 3-port models, and can be mounted in a 19 or 5-Module chassis with redundant AC and DC power supplies. It can also be installed in a 2-Module AC or DC powered chassis. The plug-in module can function as a management module and manage other modules in the same chassis, and operate as a Network Interface Device (NID). It features two Gigabit Ethernet backplane ports for connectivity to adjacent modules in a chassis for multi-port and multi-service configurations. The GM4 plug-in modules also function as a fiber transport module for the modular iConverter Ethernet and T1/E1 Multiplexer System. The standalone GM4 is available in 2, 3, and 5-port models. They are DC powered with a terminal connector and available with an external AC/DC power adapter. The 5-port model is available with dual power inputs. The 5-port model supports any combination of 10/100/1000 RJ-45 copper ports and 100Mbps or 1000Mbps SFP fiber ports to provide service demarcation ports for multiple applications and customers. 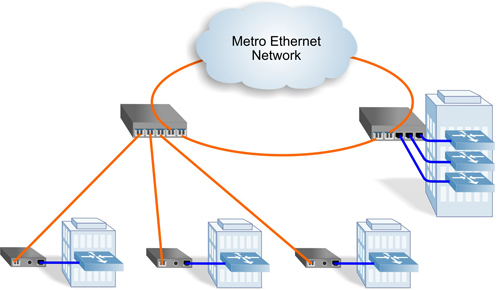 In this application example, 5-port GM4 NIDs are deployed as nodes on a Metro Ethernet ring. The 5-port GM4 NID on the left is deployed as a hub aggregation device that provides connectivity to the ring and three fiber access links to customer locations. A 2-port GM4 terminates each fiber link and provides service demarcation at each customer premises. The 5-port GM4 NID below is deployed at a Multiple tenant building with three RJ-45 UNIs providing copper connectivity to three different subscribers. 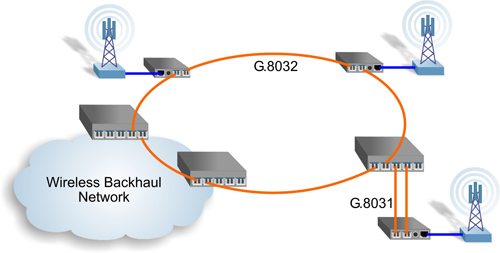 In this application example, GM4 NIDs are deployed as nodes on a wireless backhaul ring. The two 5-port GM4 NIDs connected to the Wireless Backhaul Network provide NNI functions for the ring. All GM4 NIDs on the ring support G.8032v2 Ethernet Ring Protection Switching for service protection with sub-50ms failover. The 5-port GM4 NID below provides G.8032 ring connectivity and G.8031 linear protection with a redundant fiber access link to the tower. The 3-port GM4 NIDs provide LTE service demarcation at the cell towers, and all the GM4 NIDs on the network support1588v2 clocking and G.8262 Sync-E timing. *Supported on all standalone modules and plug-in models with a 1-Module or 2-Module chassis with dying gasp support. *When using single-fiber (SF) media converter models, the Tx wavelength on one end has to match the Rx wavelength on the other. Please consult Omnitron for other configurations and RoHS (5/6) compliant models.